Living near the Indian River lagoon offers unlimited opportunities for observations of Ospreys in action. The shore of the lagoon is a prime nesting location for Ospreys as it offers a plethora of tall pines and endless opportunities to catch a meal. One morning, about two years ago, I happened to notice an Osprey collecting nesting material in my yard and heading to the tall pine in the neighbor's front yard. This was the very first nesting material to be set in this new location. My husband decided to set up a camera with a time lapse video from our front window to capture the growing nest's progress. Reviewing the video each evening turned out to be far more fascinating than I could of imagined! The Ospreys worked really hard some days and made only a few brief visits on other days. Often times it was two steps forward, three steps back as carefully placed material would soon fall to the ground. We followed the Osprey's progress for a few weeks, but unfortunately this nest didn't pass Nest Building 101. Check out the video to witness the Ospreys attempt to build their home in the wind, rain, and sun. Osprey from Adventure Online TV on Vimeo. As nesting season is quickly approaching here in Florida, I look forward to what this year may bring. There are actually 6 nests that are within a one mile radius of this tree! The success of these nests vary greatly each year. Last year one nest was actually hijacked by a pair of Great Horned Owls for about 4 weeks. Without any hatchlings, the owls left town and the nest was reclaimed by the Ospreys within a week! Ha! That picture with the surreptitious owl peering out is brilliant. Best of luck with those nests in the coming month, sounds like a wonderful opportunity. Wow! Cool time-lapse video and sad about the nest. I had a Swainson's Hawk nest near my home when I lived in Boise. Great Horned Owls took it over the following year. 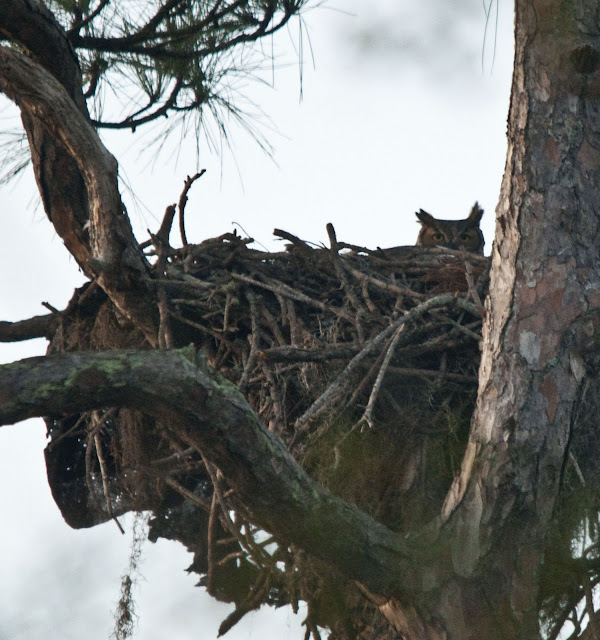 Great Horned Owls often use Red-tailed Hawk nests and even Magpie nests. I even found a Long-eared Owl nest in an old Magpie nest. Fun stuff! Tammy that Great Horned owl image in the osprey nest is just brilliant, I wish we had some here in the UK!